Cajanus bicolor DC., Cajanus flavus DC., Cajanus indicus Spreng., Cytisus cajan L.
Pigeon pea (Cajanus cajan (L.) Huth) is one of the most common tropical and subtropical legumes cultivated for its edible seeds. 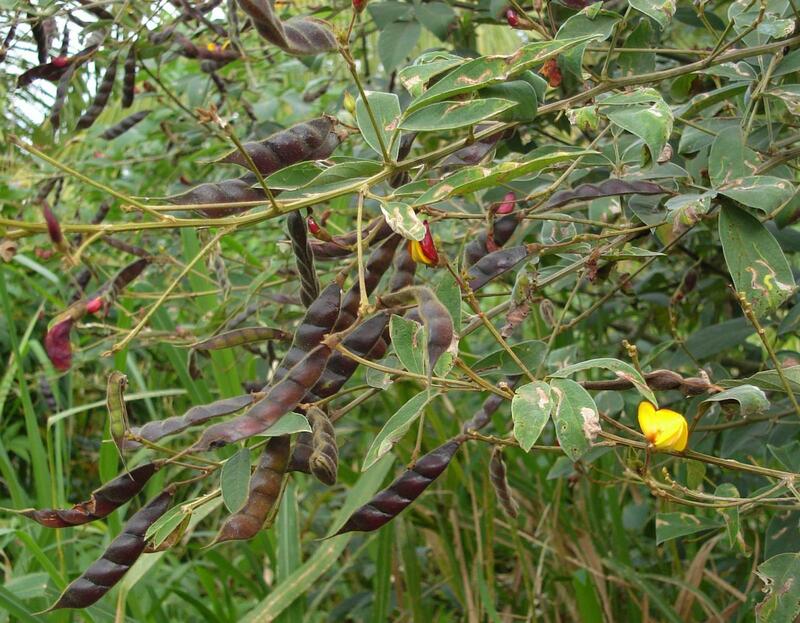 Pigeon pea is fast growing, hardy, widely adaptable, and drought resistant (Bekele-Tessema, 2007). Because of its drought resistance it can be considered of the utmost importance for food security in regions where rainfall is unreliable and droughts are prone to occur (Crop Trust, 2014). 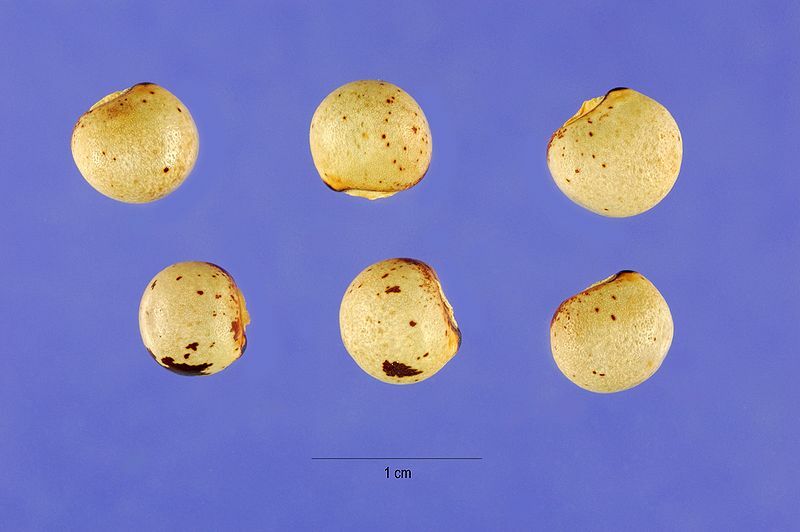 The fruit of Cajanus cajan is a flat, straight, pubescent pod, 5-9 cm long x 12-13 mm wide. It contains 2-9 seeds that are brown, red or black in colour, small and sometimes hard-coated (FAO, 2016a; Bekele-Tessema, 2007). Dry pigeon peas (seeds) are common in Indonesian and Indian cuisines. In India, pigeon peas are soaked, dried, hulled and split to prepare dhal. In Indonesia, pigeon peas are fermented with Rhizopus mould then soaked, dehulled and cooked to produce tempeh. Fermentation with Aspergillus oryza gives a sauce similar to soy sauce (Orwa et al., 2009). Dry peas can be ground and mixed with wheat flour to give a higher protein content than flour alone. Immature pods may be cooked in curries and other relishes (Orwa et al., 2009). Pigeon pea has numerous uses in animal feeding. The leaves and pods are valuable and palatable protein-rich fodder. Leaves are sometimes used to replace alfalfa in ruminant diets in areas where alfalfa cannot be grown. Seed processing by-products, and sometimes the whole seeds, are used as livestock feed (Phatak et al., 1993). The seeds can be fed to poultry, and mixtures of pigeon pea with maize grain were successfully used in Hawaii (Orwa et al., 2009). Plant breeders have created varieties adapted to drier conditions, more resistant to diseases and suited to different production systems and cropping cycles (Valenzuela, 2011). Since the 1990s there has been an increase in varieties available, allowing selection of cultivars with not only higher grain yields but also higher forage yields and crude protein (Phatak et al., 1993). The origin of pigeon pea (Cajanus cajan) is either North-Eastern Africa or India (Ecocrop, 2016; van der Maesen, 1989). Its cultivation dates back at least 3000 years (Mallikarjuna et al., 2011; van der Maesen, 1989). It is now a pantropical and subtropical species particularly suited for rainfed agriculture in semi-arid areas because of its deep taproot, heat tolerance and fast growing habit (Mallikarjuna et al., 2011). Pigeon pea can be found in both hemispheres, from 30°N to 30°S and from sea level to an altitude of 2000 m (3000 m in Venezuela) (Ecocrop, 2016). It is very heat-tolerant and grows better in places where temperatures range from 20° to 40°C and that are deprived of frost (FAO, 2016a). Though sensitive to frost, pigeon pea keeps growing at temperatures close to 0°C and tall plants can survive light frost. It does better where annual rainfall is above 625 mm. However, it is highly tolerant of dry periods and, where the soil is deep and well-structured, it continues growing with rainfall as low as 250 to 375 mm. 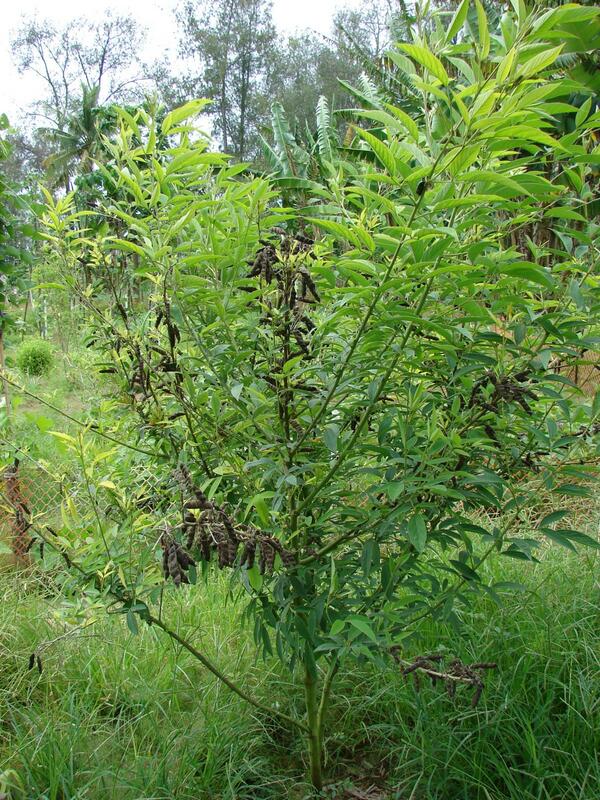 Pigeon pea can grow on a wide range of soils, from sands to heavy black clays, with variable pH. However, the best pH range is within 5-7. It has low tolerance of soil salinity, but some cultivars were reported to tolerate high (6-12 dS/m) salinity (Duke, 1983). Pigeon pea is sensitive to salt spray and waterlogging. Under shade, it shows reduced growth and bears thin, pale green foliage and few pods (FAO, 2016a). World production of pigeon peas was 4.85 million t in 2014. The main producers were India (3.29 million t, 65% of world production), Myanmar (0.57 million t), Malawi (0.3 million t), Kenya (0.28 million t) and Tanzania (0.25 million t). Most of the production occurred in Asia (79.1%), followed by Africa (17.6%) and the Americas (2.5%) (FAO, 2016b). 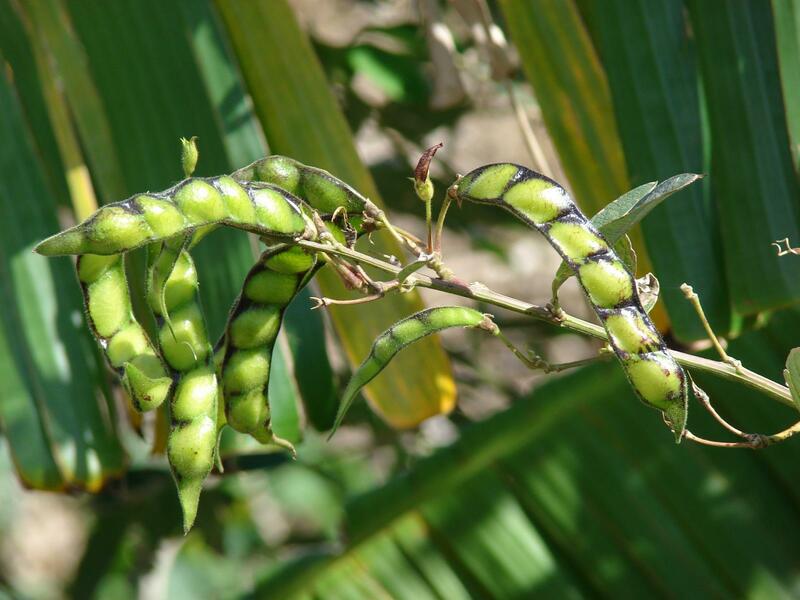 Pigeon pea can be grown for seed production, or forage production, or both. Some dual purpose cultivars have been developed. Pigeon pea cultivated for food can be sown alone or intercropped with cereal crops (maize, millet), oilcrops (cotton, groundnut, sesame) or grain legumes (cowpea) (Bekele-Tessema, 2007; Cook et al., 2005; Duke, 1983). Seeds should be sown (drilled, broadcast or hand dibbled) in a weeded, deep and well prepared seedbed at 2.5 cm to 10 cm depth (Valenzuela, 2011; AFF, 2009; Duke, 1983). Sowing as a sole crop should be done on a 2 m grid (Cook et al., 2005). Pigeon pea does not establish easily. It may require irrigation during the first 2 months if rainfall is insufficient. It is important to ensure effective weed control (Valenzuela, 2011; AFF, 2009; Duke, 1983). In association with maize, it has been recommended that pigeon pea density remains about 2 plants/m² so that competition for water is not detrimental to the maize (CIMMYT, 2011). Pigeon pea has a very variable growing pattern. Depending on the cultivar, the location and time of sowing, flowering can occur as early as 100 days or as late as 430 days. In the West Indies, the range was within 60-237 days between planting and pod formation, time for flowering being only 60 days. In India, pigeon pea can take 8 months between sowing and flowering (Duke, 1983). Pod harvest can be done by hand-picking over a long period in gardens and hedge crops. The harvest begins when about 75% of the pods have turned brown. In smallholdings, the plant is traditionally cut at the base with a sickle. It is possible to use a combine-harvester if the plants have matured uniformly and the pods are at a uniform level above the ground (CIMMYT, 2011; van der Maesen, 1989). The cut branches are dried in the field or tied in bundles which are stacked upright in order to dry, and then threshed with wooden flails, by cattle trampling or with a threshing machine (FAO, 2016a; Singh et al., 1992). Another harvesting method consists in hand-picking pods once, then letting the plant regrow, and hand-picking a second time and sometimes a third time if the quantity of pods makes the practice profitable (Singh et al., 1992). If hand-picking is not possible, it is advised to cut the upper parts of the stems bearing the mature pods, leaving enough foliage to allow the plant to regrow (Singh et al., 1992). In Colombia, pigeon peas are cultivated for feed, alternatively for seeds used in poultry rations, and for forage. In the first year the plants are cut to leave 0.5 m stubble for regrowth, and in the second year they are cut at 1 m high. Cattle are then allowed to browse the forage regrowth (FAO, 2016a). Pigeon pea is a prolific seed producer: yields vary from 0.5 to 2 t/ha (Ecocrop, 2016). In Kenya, yields of about 1 t/ha were reported (OAF, 2015). Under the harsh conditions of the South Sahel, only 650 kg of beans were produced for human consumption (FAO, 2016a). Under optimal conditions, in sole cropping, seed yields were reported to be as high as 5 t/ha in India, and about 3-4 t/ha in Indonesia (van der Maesen, 1989). In Asia, in marginal areas, yields were 700 kg/ha with sole cropping, while intercropping systems with maize yielded only 175 kg/ha (van der Maesen, 1989). In Australia and India, short-duration varieties (less than 100 days) have yielded 5 t/ha (Phatak et al., 1993). The pods can withstand weather damage (Mullen et al., 2003). Yields are normally higher during the first year, and decline in subsequent years (Duke, 1983). Pigeon pea is used as a contour hedge in erosion control (Bekele-Tessema, 2007). An N-fixing legume, it does not need inoculation before sowing. It was reported to fix 40-97 kg N/ha/year in Africa, and up to 235 kg N/ha/year in Florida, 88% being used for pod and seed formation. Pigeon pea cultivation could provide 40-60 kg N/ha to the following crop (Valenzuela, 2011). Pigeon pea had a large residual effect on unfertilized maize, increasing grain yield by 57% and total plant dry matter by 32% (Kumar Rao et al., 1983). The extensive root system of Cajanus cajan improves soil structure by breaking plow pans, and enhances water holding capacity of the soil (Crop Trust, 2014; Mallikarjuna et al., 2011). Its deep taproot is able to extract nutrients (like P) from the low layers of the soil, and deposit them in the upper layers where they can benefit other crops (Valenzuela, 2011). The leaves and immature stems can be cut and used as green manure (OAF, 2015). Fallen leaves act as a mulch and are estimated to return about 40 kg N/ha. They are also a source of organic matter, thus helping to prevent erosion due to heavy rains and to reduce soil temperature (Ecocrop, 2016). Tall varieties of pigeon pea are reported to be good windbreaks. Pigeon pea is able to provide shade to young coffee or vanilla plants, and to forest seedlings in nurseries (Valenzuela, 2011). Pigeon pea seeds are a source of protein and energy as they are rich in protein (18-28% of DM) and carbohydrates (starch 37-45% of DM), and relatively poor in fibre (crude fibre less than 10% of DM). The amino acid profile is close to that of soybean (Oshodi et al., 1993). Pigeon pea seeds contain various antinutritional factors that can have deleterious effects depending on the animal species. These include hemagglutinins, trypsin and chymotrypsin inhibitors, cyanoglucosides, alkaloids, oxalates, hydrogen cyanide, saponins, phytates, urease and tannins (Onwuka, 2006; Iorgyer et al., 2009; Nwaogu et al., 2010; Das et al., 2002). Cajanus cajan contains more trypsin and chymotrypsin inhibitors than soybean seeds, and about as much as chickpeas. The antinutritional factors of pigeon pea are responsible for its poor protein digestibility in pigs. Thus they are more detrimental to performance and reduce the feed conversion ratio when compared with chickpeas, which suggests the presence of other factors than protease inhibitors (Batterham et al., 1990). Heat treatments, such as cooking or extrusion, reduce the amount of trypsin and chymotrypsin inhibitors and increase pigeon pea digestibility (Onwuka, 2006; Batterham et al., 1993; Batterham et al., 1990). Pigeon pea seeds contain no appreciable amounts of condensed tannins (Singh, 1988; Dzowela et al., 1995). 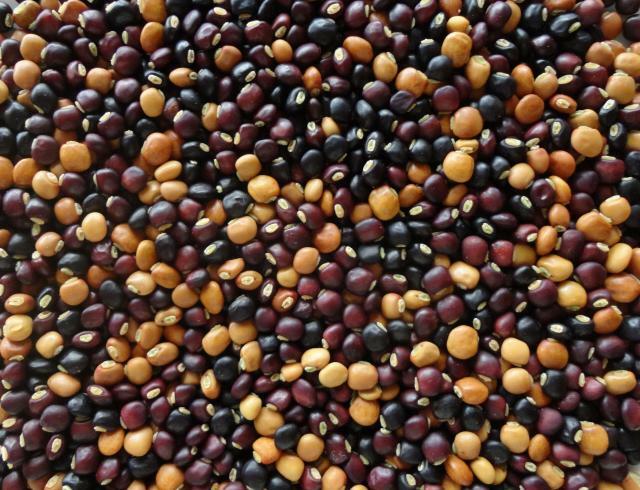 Pigeon peas are of similar quality as other legumes seeds, and can be used as a protein supplement in ruminant diets, even at high inclusion rates. Pigeon peas are highly digestible and supply good quality protein (Corriher et al., 2007). In a comparison of several legume seeds in the Southern Great Plains of the USA, the protein and in vitro digestible DM of pigeon pea seeds indicated that they could be efficient replacements for maize or cottonseed meal in livestock diets, assuming that the pigeon pea could generate enough grain biomass to be cost-effective. Though not as effective as soybean, pigeon pea was capable of accumulating useful levels of protein and digestible dry matter under the variable growing conditions of the study (Rao et al., 2009). The nutritive value of pigeon pea may also be limited by its low sulphur content, below ruminant requirements (Whiteman et al., 1980). In the USA, pigeon pea seeds were included at a rate of 20% (DM basis) in a maize silage based diet, without any detrimental effect on DM intake (22.5 kg DM/d) and milk production (42 kg/d) on early lactation Holstein cows (Corriher et al., 2010). Pigeon peas may be a good creep feed for beef calves due to their high protein and low fat levels. In the USA, when calves were creep fed pigeon peas or oats on Bermuda grass pastures, calves fed pigeon peas had 14% greater daily gains than those fed oats. They also had 15% higher weaning weights and 49% greater daily gains than the calves without creep feeding (Hill et al., 2006). In yearling beef heifers fed on a maize silage based diet (silage:concentrate ratio of 75:25 on a DM basis), pigeon pea seeds could fully replace whole cotton seeds, corn gluten feed or maize/soybean meal with no effect on the average daily gain (Corriher et al., 2007). On a rice straw based diet containing 50% of concentrate, total and iso-nitrogenous replacement of ingredients (maize, bran, oil meals) by ground pigeon pea seeds had no effect on DM intake, in vivo DM digestibility and average daily gain. Dry matter intakes ranged from 2.9 to 3.6% BW with an incorporation rate of pigeon pea seeds from 17 to 57% (Cheva-Isarakul, 1992). Pigeon pea seeds can be a source of protein for pigs. However, the nutrient and energy digestibilities of pigeon peas were found to be much lower than that of soybean meal, particularly for protein (50 vs. 81%) (Mekbungwan et al., 2004). However, no detrimental effect of pigeon pea on intestinal vili of growing pigs could be found and it was concluded that pigeon pea seed meal could be used in pig diets (Mekbungwan et al., 2003). The inclusion of 25 to 75% pigeon pea meal to the diet of growing pigs linearly depressed growth rate, feed intake and feed conversion ratio. Performance was lower than that of pigs fed on soybean meal or chickpeas (Batterham et al., 1990). These results confirmed earlier results where 45% ground pigeon pea meal, included in diets for growing pigs, degraded both daily growth rate and the FCR (Grimaud, 1988). Similar trends were reported in weaner pigs (6-7 kg) fed a diet containing 20% raw or cooked pigeon pea seed meal. Piglets fed on pigeon pea seed meal had lower weight gains and lower feed intake, and feed cost was higher with pigeon pea than for the control diet (Etuk et al., 2005). Only low levels of pigeon pea seed meal (12-14%) were reported to provide acceptable results in growing pigs (20-60 kg) (Lu Fuji et al., 1999). Variation in composition and antinutritional factors. For example there are claims that white-seeded varieties have a higher nutritional value than dark ones (Odeny, 2007), although earlier experiments failed to confirm this (Nwokolo et al., 1985). Diet formulation. In some cases the level of amino acids (particularly methionine) is deficient in experimental diets, which can lead to a mis-interpretation of results (Babiker et al., 2006). Treatments. Heat treatments seem to have a positive effect on protein digestibility and energy value (Chrysostome et al., 1998; Onu et al., 2006). Although the results are not always consistent between experiments, it is generally observed that pigeon pea lowers performance (Oso et al., 2012; Onu et al., 2006). High inclusion rates, above 20% of the diet, reduce performance (Amaefule et al., 2011; Ani et al., 2011; Etuk et al., 2003), but a reduction also occurs at rates as low as 5 to 10% (Babiker et al., 2006; Saeed et al., 2007; Oso et al., 2012). This effect seems to be higher in starter than in finisher broilers (Igene et al., 2012; Ani et al., 2011). Feed intake is often unaffected or even increased, which suggests that pigeon pea does not induce palatability problems (Tangtaweewipat et al., 1989). However, in some trials feed efficiency was reduced. In other trials growth performance was maintained with 10 to 20% raw pigeon pea in the diet (Ologhobo, 1992; de Oliveira et al., 2000; Tangtaweewipat et al., 1989; Iorgyer et al., 2009). Many trials tried to improve performance by treating the seeds with the use of heat (roasting or cooking), soaking, fermentation or dehulling (Onu et al., 2006; Abdelati et al., 2009). In most cases the growth rate of broilers was improved, with no clear advantage to one particular process, except that fermentation did not confer any advantage (Oso et al., 2012). Optimization of thermal treatments showed that over-processing (e.g. autoclaving at 120°C for 30 min) led to decreased performance (Pezzato et al., 1995). Toasted pigeon pea supported growth, when included at up to 27% of the diet for finishers. However, performance was reduced (although not significantly) in younger birds (Ani et al., 2011). Amino acid balance is important: several authors improved performance by adding methionine to the diet (but not lysine) (Amaefule et al., 2011; Babiker et al., 2006). This could be linked to the deficiency of pigeon pea in sulphur-containing amino acids (methionine and cystine), coupled with the low digestibility of protein in raw pigeon pea. Amino acid deficiency could also explain the increased feed intake in some situations. In summary, the general recommendation in broilers would be to limit incorporation to 10% pigeon pea in the diets of young birds. With processed (e.g. toasted) pigeon pea and in older birds, higher incorporation rates, up to 20%, could be used. In less intensive conditions, higher rates could be tested if pigeon pea is available at low cost. However, feed efficiency can be lowered. In all cases, particular attention should be paid to amino acid supply, particularly methionine. Feeding pigeon pea often led to reduced performance in laying hens. Hen-day egg production tended to decrease with raw pigeon pea (Amaefule et al., 2007b; Agwunobi, 2000; Tangtaweewipat et al., 1989), although in some experiments production was maintained with 20% pigeon pea in the diet (Udedibie et al., 1989). Feed intake increased, which led to a degradation of feed efficiency (Amaefule et al., 2006c; Amaefule et al., 2007a). Delayed start of lay has been recorded (Amaefule et al., 2006c; Amaefule et al., 2007a). Heat treatments such as toasting or boiling can improve performance, following the same recommendations as with broiler finishers (Amaefule et al., 2006c; Amaefule et al., 2007b). Pigeon pea can be used in diets for pullets (Amaefule et al., 2004; Amaefule et al., 2006b). The overall recommendation for layers is to use pigeon pea with care to avoid a degradation of feed efficiency. It should be safe to use 10% pigeon pea in layer diets, but addition of methionine may be necessary. Higher rates (20%) can be tested, especially if the seeds have undergone heat treatment. In quails, toasted pigeon pea allowed good growth performance at up to 20-30% in the diet. However, increased feed consumption led to a degradation of feed efficiency (Yisa et al., 2013). Pigeon pea is a potential source of protein for rabbits but information about its use for rabbits is scarce and inconclusive. It should be noted that while pigeon pea contains many antinutritional factors, some, such as phytates, are neutral for rabbits and others, like saponins or tannins, are considered of interest in rabbit nutrition, as a minimum level of these molecules is considered a positive factor (Lebas, 1987; Dalle Zotte et al., 2012). Other substances may be more or less removed by different treatments, but moderate levels are well tolerated by rabbits, including the cynanogenic glycosides (Nwaogu et al., 2010). The use of pigeon pea seeds in rabbits has been tested in Nigeria. In a comparison of raw and boiled seeds (20% of the diet), boiled seeds gave a higher growth (13.2 g/d vs. 10.3 g/d) but this may have been because of the unexpected higher protein level in boiled seeds (Iheukwumere et al., 2008; Iorgyer et al., 2009). In promoting the safe inclusion of raw pigeon pea seeds, the absence of any effect on the development of the liver and testes should be underlined (Iheukwumere et al., 2008). Boiled pigeon pea seeds (for 30 to 60 minutes, and then dried) were used safely for growing rabbits up to 30% of the diet, but higher levels were not tested (Amaefule et al., 2005; Ani, 2008). With soaked pigeon pea seeds (12 h in cold water plus 2-3 days sun-drying) the inclusion rate was safely increased up to 40%, the average daily gain increasing with the incorporation level (Duwa et al., 2011). This latter result suggests that raw untreated pigeon pea could probably be also used in rabbit feeding since this type of soaking reduced only part of the antinutritional factors such as cyanogenic compounds (Onwuka, 2006). Nevertheless, a comprehensive study on the use of raw pigeon pea seeds in rabbit feeding is necessary before it is possible to provide recommendations about their use. Pigeon pea seeds are a potential source of protein with a well-balanced amino acid profile that can replace fish meal in fish diets, but the presence of antinutritional factors may limit their use (Ndau et al., 2015). Pigeon pea seeds, raw or soaked, have been included to replace 15, 30 or 45% fish meal in isonitrogenous diets for juveniles. Inclusion of pigeon pea, either raw or soaked, decreased animal growth rate compared to the control diet. However, growth performance of fish fed on soaked pigeon pea diets was closer to that of fish fed on the control diet. It was, therefore, concluded that soaked pigeon pea seeds could replace fishmeal in fish diets in order to reduce feed costs (Ndau et al., 2015). When pigeon pea meal (pressure-cooked and sun-dried) was used to replace soybean meal, it was reported that 60% replacement resulted in improved nutrient utilization and growth in fish (Obasa et al., 2003). In Nigeria, channel catfish juveniles were fed on diets containing 40% protein, with pigeon pea meal replacing up to 100% of soybean meal, without affecting performance (Hammed et al., 2013). A comparison of raw and heat-processed seeds showed that raw pigeon peas had deleterious effects on growth and on health parameters: hemoglobin, hematocrit, red blood cells and white blood cells were all reduced. Pigeon pea seeds, fried or boiled, did not support satisfactory weight gains but had no significant effect on health parameters. Only 16h-soaked pigeon peas resulted in higher weight gains without affecting blood parameters. It was concluded that soaked pigeon peas could be included in channel catfish larvae at up to 65% of the diet (Ogunji et al., 2005).